There has been an anti-war presence at Occupy LSX outside St Paul's almost every day with Ciaron O'Reilly, Ben Griffin and others speaking in public about Bradley Manning, the ongoing war in Afghanistan and war resistance amongst other things. It's shocking how many people still aren't familiar with Bradley Manning's name. Ciaron is a Catholic Worker, long-time war resister and ex-prisoner of the US. 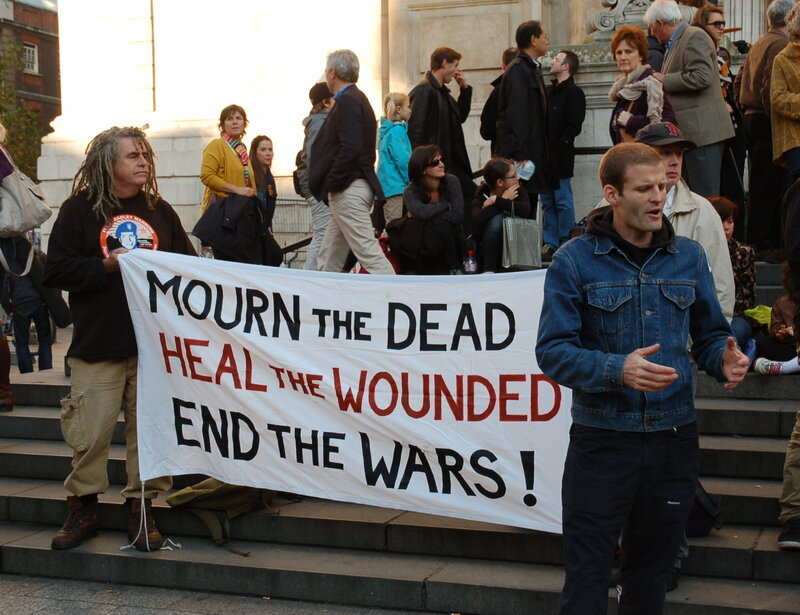 Ben is an Iraq war veteran, war refuser and founder member of Veterans for Peace UK. As well as aiming to raise awareness of Bradley Manning's situation, detained for 16 months without trial in the US, the action was in solidarity with Julian Assange, who expects to hear the outcome of his extradition appeal next week and with Michael Lyons. Lyons is the British Navy conscientious objector who was influenced by reading the WikiLeaks disclosures attributed to Bradley Manning. He is currently serving a sentence in a military prison for standing up for his beliefs. The speeches have generated a lot of interest, with many people coming up to speak with Ben and Ciaron afterwards, taking flyers and addresses to write to Bradley and Michael in prison. Veterans for Peace is interested in working with any UK military vets who are committed to working for peace. Complete this form to get involved. We are veterans based in the UK committed to promoting peace through non-violent action. Veterans from all three branches of the UK military may join. Veterans from other countries based in the UK may also join. We are independent of any political party or movement. We are not concerned with political power only the promotion of peace.